I’d be lying if I said I wasn’t a little unsure about my ability to blog Ore Monogatari!! through the end of its runtime. As much as I like it, I can’t really deny that there’s a gap between substance and depth in this show that was highlighted in this episode—plenty of teases at going deeper, but no actual commitment. Which isn’t, by any means, a terrible thing for a show like this, it’s just not all that conducive to weekly blogging. I guess that’s kind of an ominous way to being a post about an arc climax episode, huh? I definitely don’t mean to be down on Ore Monogatari!! this week—as far as episodes go, this was a strong one. But the general lack of thoughts I seem to have regarding it is…well, perhaps it’s just a signifier of what kind of show Ore Monogatari!! really is. But maybe more on that later—let’s talk this episode first. As far as structure of the episode goes, this was kind of an interesting (if logical) way to go about balancing the gravity of Suna’s father’s surgery with with absolute fluff that was Yamato and Takeo’s birthday date. 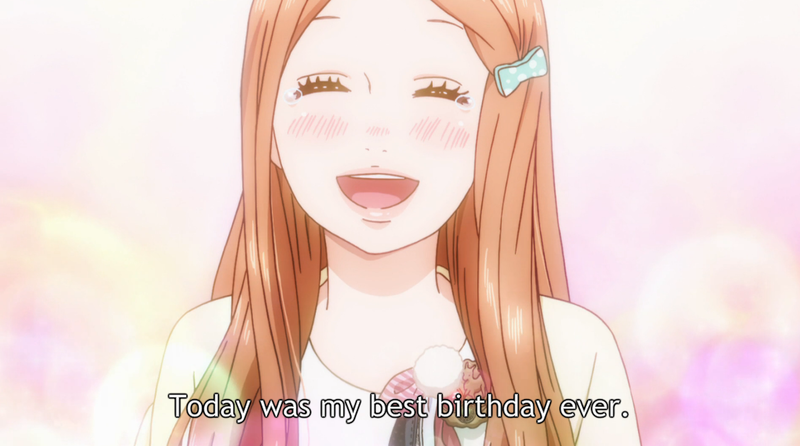 Suna moments bookended the episode, framing Yamato’s birthday as a sort of euphoric distraction from a more serious reality. In a way, that’s reflective of the general experience of watching this show. It’s adorable and happy and cute and real, but it’s overwhelmingly one-sided in its portrayal of the good things in life. 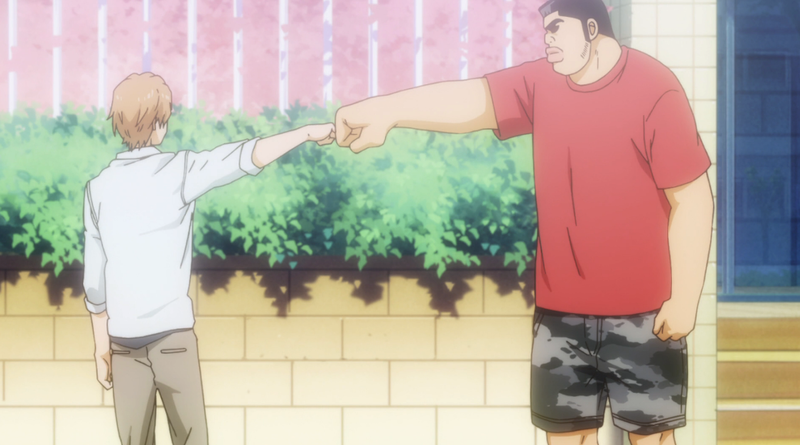 I know I’ve talked about the ways I think the show idealizes Takeo and, certainly, Ore Monogatari!! has hinted at some darker undertones (Takeo’s warped self-perceptions, the ways he unconsciously hurts Yamato, the struggle to communicate); however, the status quo here is cute cute cute. And, oh man, when Ore Monogatari!! goes for the cute, it’s really cute! The hints at more serious material, though, were nothing if not intriguing. Well, the one actual hint and the one significant pattern I noticed. The actual hint we got came from the one drop of Yamato’s guard (facade???) when Takeo makes the perhaps overconfident, perhaps naive (banking on the second option) comment that Suna thought Yamato would have fun no matter where she and Takeo went. “I’m not that easygoing,” she says, looking at the ground and her moe eyes suddenly drawn quite seriously, as the shot frames her in diegetic shadows. Is this it? I thought, suddenly thrilled. Is this the moment where Takeo’s constant praise of SUNA’S work planning the day suddenly comes back to bite him—as he risks making it sound like he actually didn’t think of any of this himself? Of course, it wasn’t because Yamato retreats back to her normal cutesy self, but it was a fascinating peek nonetheless. The pattern I noticed, then, was how often Takeo speaks out loud of everything except his expressions of his love for Yamato. We the audience are constantly hearing his exclamations of “I love her!” and “I’m glad you were born!” but Yamato doesn’t. At the very, very least, it’s an incredibly clever statement on the differences in the ways guys and girls typically express themselves; at the most, it’s the beginning of a potentially huge fissure in their relationship—but it’s not there yet. Which, of course, goes back to the whole communication problem thing Ore Monogatari!! has danced around for a while now, but I’m not even sure that Ore Monogatari!! is aware of this pattern outside of the fact that it is expertly and efficiently calculated to generate maximum aww’s from me (which, of course, it does). But I can only survive so long on teases and patterns—and, frankly, I think I find them more frustrating than exciting. To date, Ore Monogatari!! has delivered the goods on few of these subtle hints at flaws in the relationship. While I’m certainly not campaigning for an ugly break-up or anything like that (although Takeo leaving Yamato for Suna could be convincing…), but I want some payoff. The raw material is there. It’s all over the place—and yes, I knooowww Takeo and Yamato are still very much in the honeymoon period of their relationship—so why not do something with it? Maybe part of the problem is in the execution. Moments like Yamato’s “I’m not that easygoing” feel immediate to me. They feel like imminent crises, but they inevitably get sidelined for the cute status quo. Which, I guess, I don’t really like? These cues don’t read like foreshadowing to me; they read like transitions into more serious moments. Long term, that means I can only blog about Takeo and Yamato being ridiculously cute at each other for so long before I run out of things to say. I’m not interested in just summarizing the episodes—I want to analyze and interpret, and a lot of times I feel like I’m stretching far more than I should have to in order to find an angle. Which I guess is a little ridiculous, especially considering that these last two episodes have both definitely possessed the substance and depth about which I wrote at the beginning of the post. Anyways! 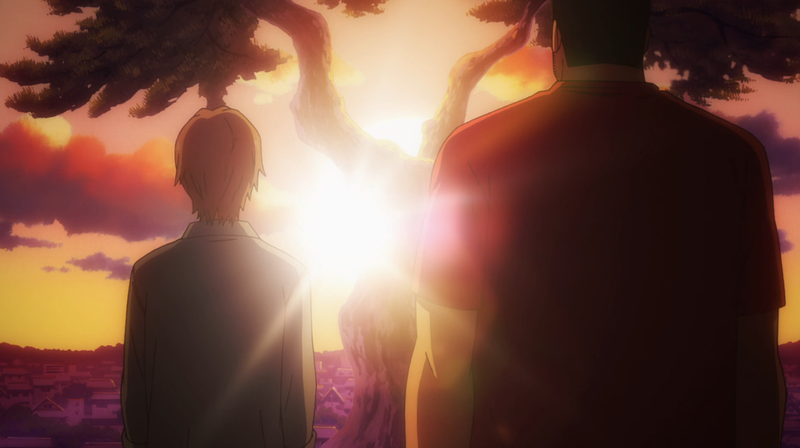 Ultimately, friendship ruled today as Takeo’s hand to Suna’s back said more about their friendship than any words could. In this situation, Takeo’s penchant for action over words (remember what I was saying about how Takeo thinks his “I love yous”?) actually makes him the best person ever to support Suna. It was actually kind of incredible to see Takeo, after his struggle to understand Suna’s needs last week, suddenly morph into a really excellent caregiver in the midst of his friend’s pain and guilt. Takeo said no more than he had to and his mere presence (along with a supportive hand) was really what counted. It was cool. What was even cooler was seeing Yamato (whether for Suna, or for Takeo via Suna) show up in the hospital for her own show of support for Suna. Of course, hidden behind there is the element of this day being Yamato’s birthday. And, somehow, she’s wound up making paper cranes for her boyfriend’s best friend. Rough breaks for Yamato, but she seems pretty darn good at rolling with the punches—and, again, I find myself wondering when the damn will burst (or if it ever will). And when she says this was her best birthday ever, I’m frankly not sure I believe her. Maybe the problem’s with me…I don’t know. Am I simultaneously overthinking and underselling Ore Monogatari! !, guys? It’s been 9 weeks and I feel like I still don’t have a grasp of what kind of show Ore Monogatari!! is or how I should think about it. Save me! Ore Monogatari! !Episode 9, My Love Story! !, Ore Monogatari!! ← Announcement: Introducing Aniwords on Crunchyroll! Mercifully, they downplayed Yamato’s uncertaintities this time round. Other than that, it pretty much went down like that. But they made it work for me. 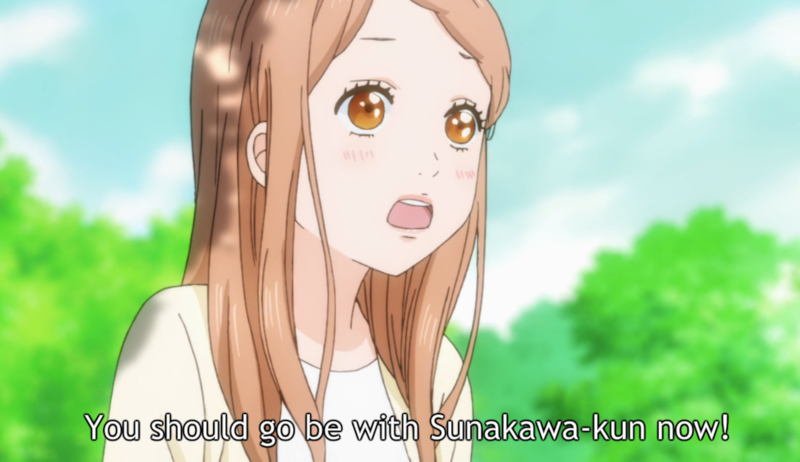 I made above statement in the context of the possibility of Suna actually wanting to be alone (which I’d have liked to see as a personal indulgence, since that’s how it would have been for me). The thing is, because of Takeo’s interior monologue about not understanding what Suna really wants but still being there because he’s his friend, I can’t tell what characterisation position the show actually takes. Together Takeo and Yamato provide the most naive point of view possible, and at the same time Suna is extremely… not secretive, but holding back. As a result, the show might appear more idealistic than it actually is. I have no idea how much of the idealism I perceive in the show is character bias, and how much wishfulfillment. 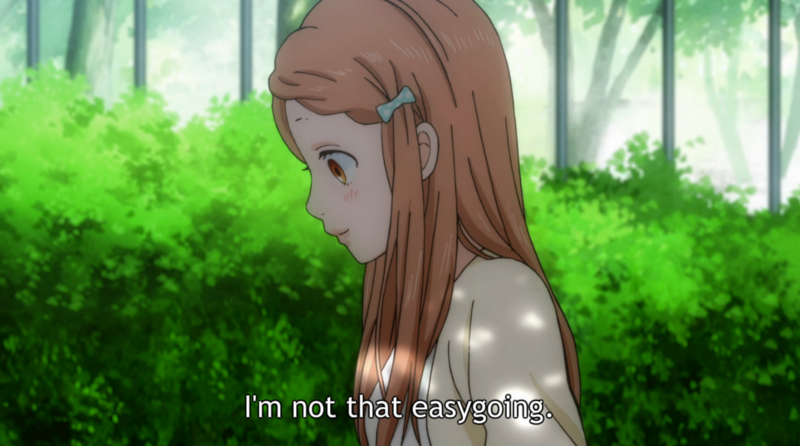 Ooo, that’s an interesting take on “I’m not that easygoing,” turning it around so Yamato’s actually kind of supporting him. Or something. Like you said, it’s complicated and the show doesn’t really tip its hand much as to whether or not it’s eventually going to tackle these issues or not. From what I understand, Ore Monogatari!! is probably trying to create a serious story so I’m guessing that towards the end, the story will take an even more serious or dramatic turn. However, I don’t think that it has a particular theme or a message and therefore it will probably not explore much of the relationship problems you’ve outlined at least in the way you want it to do so. I think that the themes and concepts that you notice are just a by-product of the dramatic story they are trying to create and that’s why you may feel that they aren’t delivering on foreshadowing (because the foreshadowing itself is accidental). Of course, I could be completely wrong but that is the impression I got till now. Hm, accidental foreshadowing, huh? I guess that could be it—it definitely does feel like Ore Monogatari!! does eventually want to do something really substantive with this relationship, but it’s hard to tell which way it’s going right now. I say don’t over think this one; I could easily overthink it myself because there is more in there than then your average shoujo fluff. However, it is a shoujo show, so even though a range of audience members are enjoying it, it was still made with a specific audience member in mind. 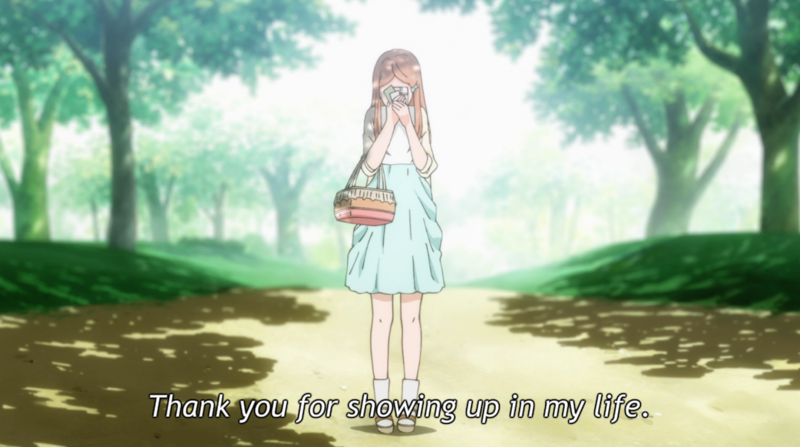 I’m a couple years out of teenhood, but Ore Monogatari has made me tear up more in the past nine episodes than I have for any series in a long time…closest was maybe Harry Potter…and that was awhile ago. I love that I can eat up all the CUTE CUTE CUTE stuff and still find some substance of friendship and decency and honor and humanity beneath all the sparkles. We really reached the “there are only cute things, what else is there to talk about?! (although cute things are pretty good to talk about)” stage eh. No no I meant good. I think we might really be approaching that situation unless the show throws us some good ‘events’, which I actually think they will eventually. Plus, the bromance is… sweet? (I don’t know how else to describe it. Haha.) So it’s still quite interesting to talk about. Honestly, I think it’s hard to analytically approach any kind of show on episodic basis. IMHO it tends to be better to do that by the end of a given series, when you can finally see the picture in full and as a whole. Try to suss out the theme, plot direction, and character arcs after every episode, and there’s a great chance that, quoting from certain someone, “you’re probably overanalyzing or misunderstanding this”. It’s especially hard for something like OreMono, because the show almost entirely consisted of ‘pieces’, because things just sort of happened without necessarily having to be crucial for the plot development (recall Takeo’s mom pregnancy again), and because characters just act and react the way they feel at the moment instead of being pawns for some big themes/future plot mechanism/some sort of symbolism. The author might be preparing a build-up all along for something ‘big’, but even if it’s the case, I doubt we’d get to see it by the end of this anime adaptation…it’s, frankly, not conducive at all to enjoy this show by keep trying to figure it out. Looks like another cutepisode next. Might want to strongly consider doing multi-episode post or just whenever you feel like it for this one, Bless, especially since it’s going to be a turn of season soon. Yeah, I’ve actually been thinking of switching up my schedule when the season turns—doing a post once every two weeks or something like that. Last summer was when I felt I was doing my best blogging and then I was only doing one scheduled episodic post a week (Zankyou no Terror). I sort of feel like I’d like to go back to that, freeing up a little more time to work on other projects or do an episode post for a random episode here or there. And oh man, you really hit the nail on the head with the end of your last paragraph there. Ore Monogatari!! is such an outspoken show that, like you said, there’s not really that much decoding to be done! These characters are so authentic and genuine that—unlike shows such as Oregairu—you don’t really need a whole bunch of analysis to suss out the core of what they’re saying…hmhmhm. I think you probably are overthinking it. My Love Story is nothing more than that… the story of a guy and the two people making an impact on his life. It’s clearly not trying to be any more. It’s not trying to have a huge theme or message. Everything in it is very personal. If it doesn’t speak to you on a personal level that’s not the story’s fault or your fault. Not every story can connect with every person. It does speak to me on a personal level and I am loving it to death. And I think this is the second time you’ve told me I’m overthinking things. 😛 Maybe I should listen to you this time haha. It’s weird for me to have to feel out my expectations for a show for this long, but I sort of think that’s what I’m still doing. I ended up watching episodes 8 and 9 back-to-back. Not from any grand plan, just the way it worked out. I might have been a happy accident, though, since it happened to be a two-episode arc and the two episodes fit together very nicely. It does make it harder to judge them individually, but I thought it was a strong arc and did a really nice job adding more depth to Suna’s character. That’s where the real conflict in episode 9 was to me – Takeo caught in the middle between two self-sacrificing people, wanting to be there for both of them when each would (and did) tell him to go be with the other one. The only slightly annoying thing to me was the two of them deciding to cut Yamato out of the loop without even talking to her about it. They could have all worked something out together, like Takeo spends the first part of the day with Yamato and then goes to the hospital later in the afternoon – which is basically what happens anyway, except that it would’ve been a much more graceful goodbye and much less upsetting to her than finding out so suddenly like that. I get that they didn’t want to dampen her birthday celebration, but I don’t think it would have. Takeo still had a wonderful day with her even though he knew, so there’s no reason she couldn’t have done the same. Anyway, issues aside, I side with the others who’ve said that you’re thinking too hard. My perspective on what kind of show it is has been the same since around episode 4. It’s a romantic comedy about two high schoolers in their first-ever relationship, learning how to be a couple together. New challenges arise that they’ve never faced before – peer gossip, intimacy issues, conflicting commitments, needing money now that you have someone to spend it on, etc. – and they tackle them and at the end of the day hopefully get through them. And like real life, some of those issues will be bigger and meatier, and some will be smaller and more straightforward (like Takeo getting a job, which is dealt with in about five minutes). Like you said yourself, this isn’t a subtle show, nor is it an especially complicated one. When something’s genuinely bothering Yamato, or bothering Suna, it makes sure we know about it. It almost has to, since the show is primarily from Takeo’s POV and he’s so thick that he’d miss things if they were too subtle. 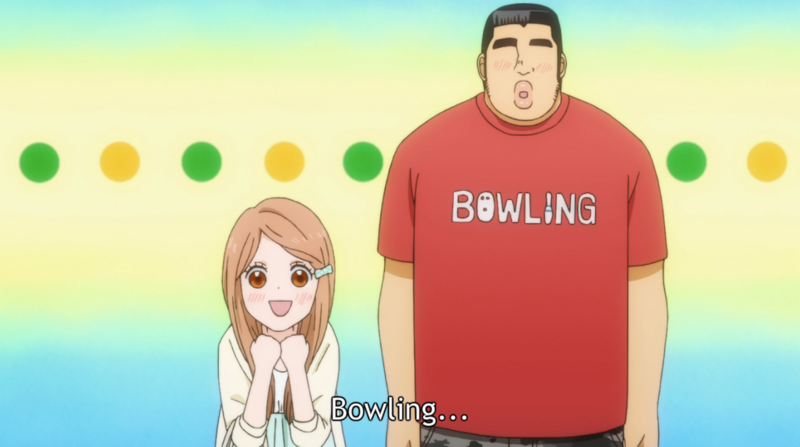 Oh, and on the topic of Suna and Takeo weighting their shared memories differently that you brought up in your episode 8 review, I noticed that too, but I had a different perspective. 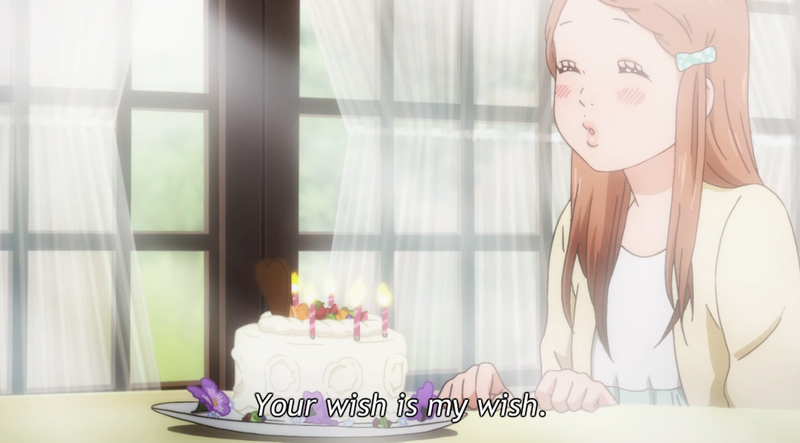 While these were fond memories for Suna that weren’t such a big deal to Takeo, we’ve also seen it go the other way too. The kindergarten play is one of Takeo’s fondest memories, but as we found out several episodes ago, that particular one’s not such a big deal to Suna. It’s not really a “divide,” it’s just one of those fascinating things about memory and perception that people constantly attach different relative importances to the same event. Events and memories that resonate with our own life experiences and values are always the ones that are going to be felt most strongly and recalled most quickly. For Takeo, who’s always been distrusted by strangers because of his unusual size and looks, it’s a story of an outsider finding love and acceptance that carries so much weight with him. For Suna, he seems to treasure the times that Takeo made him laugh – with an ailing father and an older sister who doesn’t strike me as a very playful type, I get the impression that there just wasn’t a lot of laughter in his house growing up. 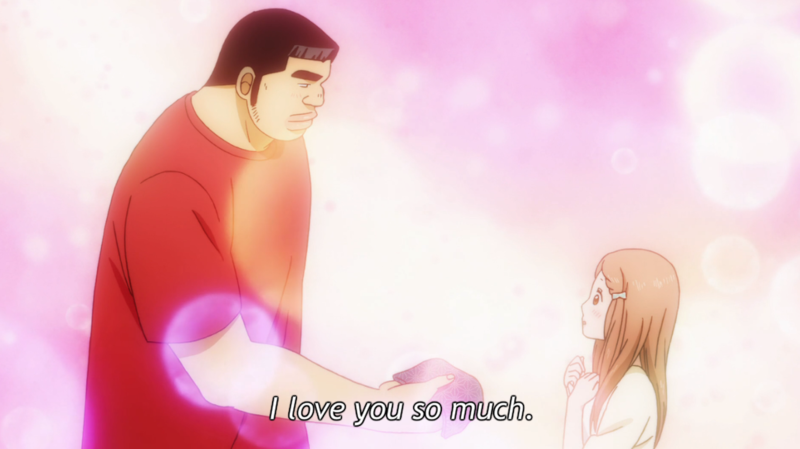 I really like your take on Suna and Takeo’s shared memories. Because, you’re right, it’s not like Takeo doesn’t have any memories with Suna—it’s just that the memories he’s focused on are different. I’m also in agreement with your disappointment about the way they cut Yamato out of the communication. I sort of see it as them treating her with kid gloves or something; and she obviously deserves better than that. I think this ep encapsulated Takeo’s basic dilemma – choosing between two people, both of whom would cheerfully saw off body parts for him, but neither of which are consistently and entirely straight with him either. If every two weeks, or every arc (with special bulletins as needed) works for you, I say go for it. There’s certainly depths here, but they don’t lend themselves well your introspective style.